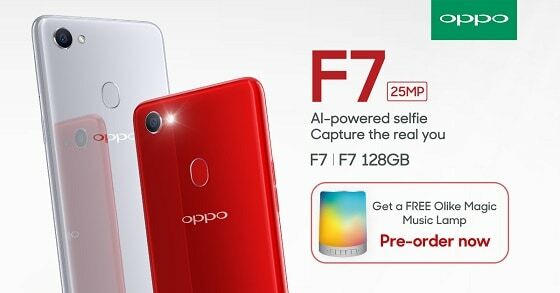 OPPO F7 is now on pre-order. Register for this powerful handset and get a free OLIKE LED Bluetooth Speaker. OPPO F7 is now in pre-order status. The smartphone boasts the highest 25MP front camera and A.I. Beauty Technology 2.0 among its great features. Customers who will avail of the OPPO F7 Pre-order will get a free Olike Magic Music Lamp bluetooth speaker. Pre-orders for the OPPO F7 are available from April 12 to April 20, 2018 in more than 5,000 OPPO stores nationwide. You can claim it starting April 21 from the store you availed the pre-order. A security deposit of ₱1,000 is required to pre-order the OPPO F7. There is also an option to fully pay upfront and claim starting April 21. The OPPO F7 is priced at ₱17,990 and is available in two colors, Solar Red and Moonlight Silver. Selfies will show the best possible personalized beauty for every person by analyzing 296 facial points in the face of the subject. The T-Zone, cheeks, lips, and even eye area are precisely enhanced to remove imperfections and impurities, allowing a pleasant and natural looking selfie. Indoor or bright outdoors, the Hardware HDR sensor on the OPPO F7 ensures the best exposure possible in every selfie and even reduces the delay of shutter speed because of its dedicated hardware to implement this process. Flaunting a 6.23” FHD+ Super Full Screen display, the F7 brings bigger screen experience along with vivid color production, while still maintaining the footprint of a 5.5” smartphone which fits nicely to the hand. Furthermore, the OPPO F7 has the latest 12nm Octa-Core processor with 2 dedicated A.I. processors for faster computing, and dedicated A.I. applications such as album organization and superior battery management of up to 15 hours of single charge usage. All these are wrapped in a whole new glossy unique design and stunning colors of Solar Red and Moonlight Silver. 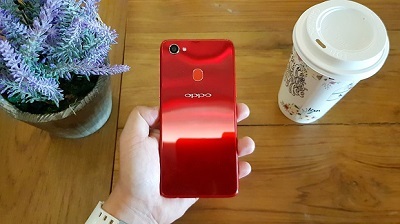 OPPO will have more promotions in the upcoming weeks and especially on the availability date of the OPPO F7.